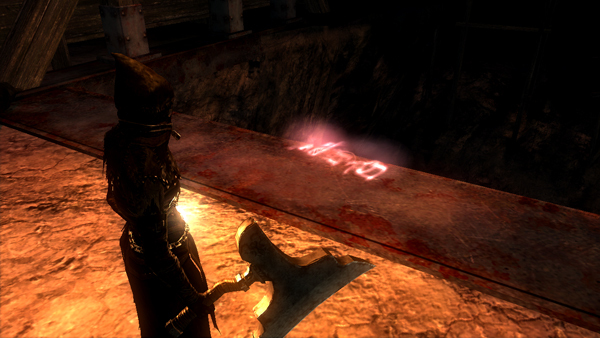 Online play information for Demon's Souls refers to aspects of the game that necessitate interaction with an online server, from multiplayer to "server tendency". Please read on for more details. The official servers were shut down on February 28th, 2018. Please be mindful that connecting your PS3 to a third-party network may not be secure, and the hosts would be able to see your IP and other information that your PS3 may broadcast. Please join such community servers only after validating what information is collected and what it is used for. Online play plays a huge part in the game and is integrated into the single-player experience, connection to the PlayStation Network is required. Players who are not connected to the network won't be able to experience some of the gameplay elements available in the game. While playing the game, players will sometimes see the ghostly white transparent figures of other players who are currently playing the same location as you do but in a parallel world. When a player dies, they will leave a bloodstain for other players in the same location to be found. When activated, it will show a red ghost reenacting their final moments before dying in hopes that it can help other players in the parallel worlds avoid the same fate. Also another way of helping other players is by leaving messages on the floor as a warning to for others to see. The use includes warning other players of imminent danger around the corner, leaving helpful tips on how to progress the level or defeat a specific enemy and more. Sometimes players intentionally leaves wrong information that leads to the readers death. Other players will be shown in the game world as phantoms (ghosts). You cannot interact with phantoms, and they cannot interact with you. Use other phantoms as a guide to what may happen next in-game. Examine a blood stain left behind in a spot where another player died, and you'll view a replay of that player's death. Like with phantoms, you can use this as a guide to what may happen next. The messages you can write in the main menu will be sent to other players. You'll also receive messages written by other players in your world. Messages can be rated. If other players rate your messages, you'll regain a little HP. - A Soul Sign is sent to other worlds, and you are summoned from those other worlds as a Phantom. If you succeed in helping the summoner defeat a demon, you will regain your body. The clients use a Blue Eye Stone (clients must be in soul form) to cast a soul sign. If the host defeats the area's boss, the clients will receive rewards and return to their own worlds. If the clients or host die or any return items are used, the client will return to their own world. If the host is defeated, the client will receive rewards and return to their own world. - A red Soul Sign is sent to other worlds, and you are summoned from those other worlds as a Black Phantom. In the other world, you wager Souls in combat against the one who summoned you. The clients use a Red Eye Stone (clients must be in soul form) to cast a red soul sign. If the client dies, or any return items are used, the client will return to their own world.